In addition to the washer dancing around and the top banging during the spin cycle, another sure sign that the snubber assembly is bad in your Maytag Performa washer is a bunch of white shavings around the main drive pulley. What you see in the photo above are the snubber ring shavings. There is a small raised bead around the ring and when it wears away, it allows the milkstool to drop down an extra 1/4 inch which, in turn, makes the spring tension way to week to keep any type of load balanced without the machine beating itself to death or trying to walk out of the house. While this isn’t a very difficult job, it does require a complete tear down of the machine. When I do this job, I remove all the motor wiring and pull the drain hose back into the cabinet and remove the complete outer cabinet. Then to remove the springs I use metal electric outlet boxes, (6 of them, one for each spring), wedge a box into each spring so they will stay stretched when you remove them. Then gently pull the tub towards each spring as you carefully remove it being carefull not to pull the boxes out of the springs. When you reinstall each spring make sure you get the spring hook in the base plate back up thru the holes and lean the tub towards each spring as you reinstall each one. Once the wash tub and milkstool assembly is out, turn it upside down on two 4×4’s so it sits nice and sturdy to work on. Now this is where you need to be very carefull. The brake stator that holds the snubber ring in place is held on by 6 5/16″ bolts and that brake is under like 200pounds of pressure. Carefully back out each screw just a couple of turns, (you will need to back them all out about halfway, just go slow and even and make sure none come all the way out), until you can wiggle the snubber ring out from under the stator and reinstall the new one, tighten the six bolts back down. Clean the snubber ring surface and the base plate real good with rubbing alcohol and then sprinkle some corn starch on the base plate where the snubber ring rides and put it all back together. 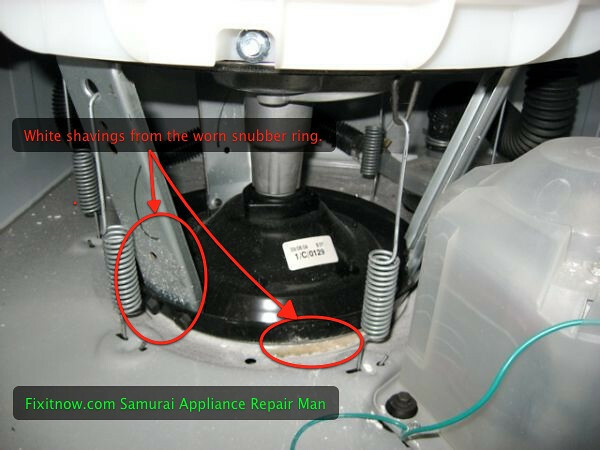 This entry was posted in Washer Repair on October 19, 2010 by Samurai Appliance Repair Man.